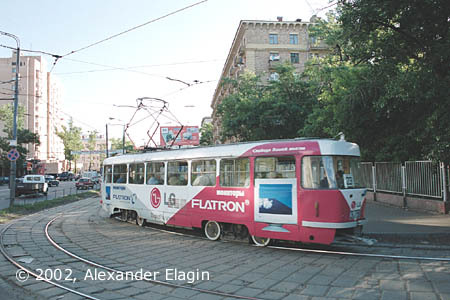 Let us continue our retro-excursion along the line closed on May 26, 2002. 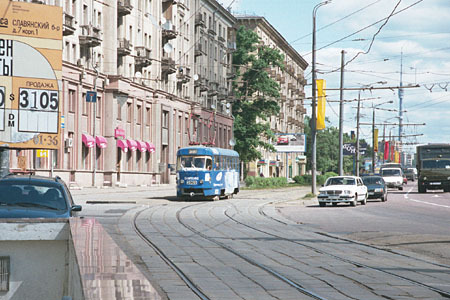 The tracks crossed 2nd Botkinskiy Proyezd that branches to the left. There is also a pedestrian tunnel under Begovaya Street, and you can see one of its entrances in the left bottom corner of this photo. As usual, this tunnel had convenient connections with tram stops. The very name Begovaya tells that there is the Moscow race-course here; the solemn main entrance can bee seen in the centre beyond the trees. 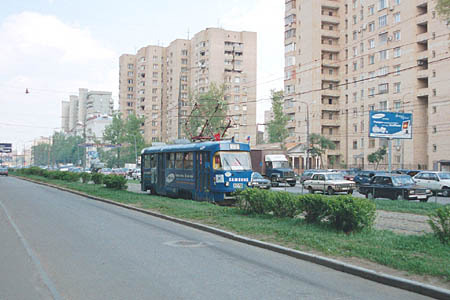 This part of Begovaya Street has no special places of interest - just a number of modern dwelling houses. Note how bright green tramway lanes shine between ugly asphalt grey roads. 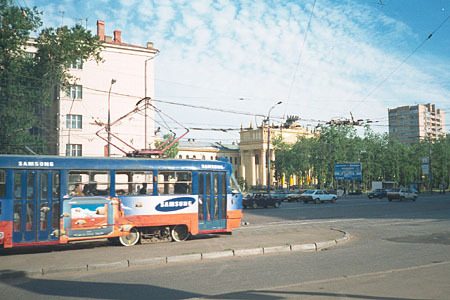 This T3 tramcar of route 23 enters Begovaya Street.